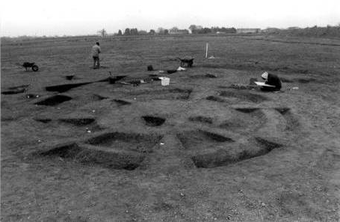 An archaeological excavation was carried out in advance of mineral extraction and the construction of an agricultural reservoir at Lodge Farm, St Osyth Essex from May 2000 to February 2003. The archaeological work was undertaken by Essex County Council Field Archaeology Unit and was financed by Sewells Reservoir Construction Ltd, Essex County Council and English Heritage via the Aggregates Levy Sustainability Fund. The main findings were a previously unknown causewayed enclosure, a pond barrow, Late Neolithic / Early Bronze Age ring-ditches, a Middle Bronze Age ring-ditch group, a Middle Iron Age settlement, Middle/Late Iron Age and Roman enclosures and trackways, Early Saxon pits and a medieval farmstead. Cropmark evidence suggests that the causewayed enclosure lay alongside a small cursus. More than 100 Early Neolithic pits were present within the interior of the causewayed enclosure. In some of these pits were large groups of worked flint and pottery in the Mildenhall style of the Early Neolithic. Radiocarbon dating revealed that the associated Early Neolithic activity was of short duration and took place in either c. 3640 cal BC or 3550 cal BC. The pond barrow appears to have been used as a pyre site and was accompanied by cremation burials in Collared Urns. The Middle Bronze Age features comprised cremation burials in Bucket Urns and twenty-two small ring-ditches. The Middle Iron Age features overlay these earlier monuments and consisted of round-houses and post-built structures centred on a T-junction of ditched trackways. Users of the Lodge Farm archive may like to note that the radiocarbon dates from this project can be found in the Archaeological Site Index to Radiocarbon Dates from Great Britain and Ireland hosted by the ADS. Germany, M. 2007: Neolithic and Bronze Age Monuments and Middle Iron Age settlement at Lodge Farm, St Osyth, Essex: Excavations 2000-3. East Anglian Archaeology 117.